Official transcripts are documents provided directly from Richard Bland College of William & Mary to the recipient; they bear the college seal and the signature of the Director of Records & Registration. Official transcripts at RBC are printed on official transcript paper, issued in a sealed envelope, and rendered unofficial if the seal on the envelope is broken. 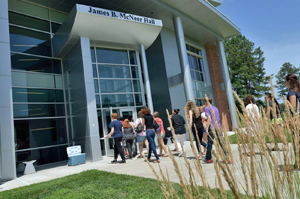 Some institutions will not accept a hand-delivered transcript as official; instead, it must be mailed directly from Richard Bland College. You should check the policy of the receiving institution before you decide to hand-deliver your transcripts. You will need an official transcript if you are planning to transfer your classes to another college. You may also need an official transcript if you are registering with a state examination board, or when you apply for a scholarship or a job. In most cases, the requestor will tell you if the transcript must be official. Order it online through the National Student Clearinghouse. You will be required to create a personal profile, submit a transcript request for each recipient, sign electronically, and pay by credit card. Richard Bland College will process the request(s). Ordering transcripts online allows students to track the progress of their requests. In Person: Official transcripts can be requested in person by visiting the the Records & Registration Office in the Enrollment Services Building. By Mail: Transcripts may be requested by mail. Use the Transcript Request Form. Requests sent by mail must include payment ($5 per official transcript) in the form of check or money order made payable to Richard Bland College (please do not send cash in the mail). The College does not currently accept credit card payments for transcripts. To pay by credit card, visit www.studentclearinghouse.org. Banner Web Account: Click link. In Person: (complete the Transcript Request Form) and show photo identification. By Mail : with your dated signature, Social Security number or Student ID number and the address to which the transcript is to be sent. By Fax: at (804) 862-6189 with your dated signature, Social Security number or Student ID number and the address to which the transcript is to be sent. Any transcript mailed through the United States Postal Service may take up to 10 business days to reach its destination. Note: Transcripts cannot be released if a financial hold has been placed on your account. This hold must be resolved before a transcript request will be processed. Official transcripts issued to students will bear the stamp “Official Transcript Issued to Student” and will be placed in a signed, sealed envelope. Please be sure to follow the required instructions of the receiving institution/agency for an official transcript. A photo ID is required to pick up a transcript. If the transcript will be picked up by someone other than the student, the person’s name and telephone number must accompany the original request and that person must provide a photo ID. The student will be notified via email when the transcript is ready for pickup.